Drawstring bags are a wearable alternative to promote your brand. The cinch design secures items in the bag and the straps can easily be worn, making this backpack style of bag an excellent option for students and younger demographics. 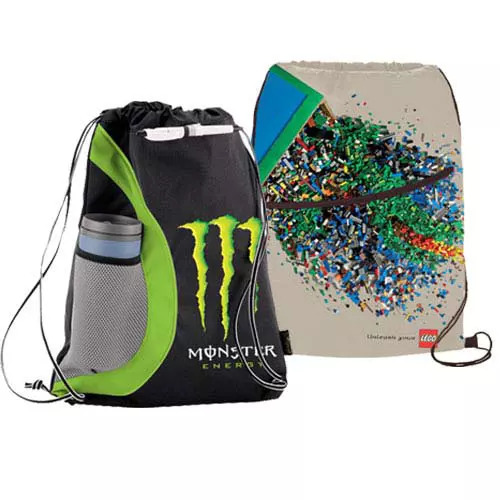 For a great deal on an effective promotional product, find out below how to partner with us to source custom wholesale drawstring bags. Our drawstring bags are made from eco materials that are recycled content and can be recycled when they have fulfilled their usefulness. Fabrics like 80 GSM non-woven materials, 210D polyester, recycled materials, and more ensure these bags align with your green goals and standards. All customized reusable bags are intended to and are effective at spreading a branding message. Drawstring bags are designed to be worn, and this feature increases the visibility of the marketing information printed on the bag. When your customers wear a drawstring bag they display your marketing info on their back at an easy to see level. This is a highly visible location that effectively distributes your information to a wide audience. The basic design is similar across all of our drawstring bags, but there are ways to customize your bag. Select the material you want for your bag to make it unique. All of our materials are eco-friendly and durable, but each fabric provides different advantages. Some fabrics accept full-color printing. This technique allows for multiple colors which is ideal for detailed artwork and ensures your message stands out. We can also make your bag from a lighter weight fabric, which can be beneficial given that the bag is designed to be worn. We even have drawstring bags made from insulated fabric to keep drinks and snacks chilled. We have drawstring bags with zip pockets, as well as pockets to hold a water bottle, reflective stripes and ports to feed a headphone cable through. Each design is different and gives the bag function. You can also create your own completely custom wholesale drawstring bags. Adjust the design and add whatever features you want to create a bag that will appeal to your customers. The more function your wholesale drawstring bags provide, the more your customers will use the bag and display your branding information. The only thing better than custom drawstring bags are custom wholesale drawstring bags. Wholesale pricing enables you to make the most of your marketing budget. By increasing the quantity of your order with us, you are able to secure a lower price per bag for an even better deal on a custom product. With such a large selection of drawstring bags, we make it easy for you to find a style that works for your brand and budget. All of our bags are eco-friendly, ensuring these bags will also support your brand’s green standards. Learn more and start designing your very own wholesale drawstring bags with Factory Direct promos today! With almost three decades in the business, we make it easy. Partnering with us means our team is always ready to help should you have questions. We have even been known to be on the phone at 3am to our factory in China, just to make sure our customers are getting exactly what they want and need. Reach out now and get your personalized quote for wholesale drawstring bags!